This product has a lot to go on. If you pick up a box you would think you are carrying a baby. The box itself though only packing 20 packs, is heavier than most due to the thickness of the cards. What other thoughts did I have on this one of a kind eye attention drooler..read below! First off, I would like to say thanks to the WONDERFUL people at Panini America for providing us with this box to review. Here are many places you can find Panini America: official site, blog, Twitter, and Facebook. If you don't follow them at all..you should! They talk to you on Twitter, have contests on their blog and Facebook and the site is also fun to visit! 3 Autographs and 35 Rookie Cards Per Box! BASE CARDS: Set collectors rejoice! 90's fans throw your hands up in the air! Panini jump and down and celebrate one eye popping base set. If you are into a product that brings pretty much everything, this is for you. 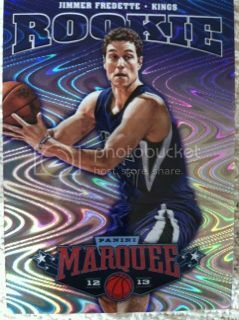 Alone, the main base set in Marquee is 540 cards consisting of rookies, stars and legends. 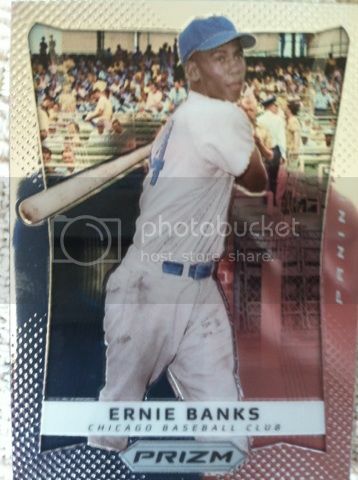 But, its not just the same kind of card over and over again like most companies do with big base sets.Panini did a great job here breaking it all down to different rookie subsets with different textures and color. This is very eye appealing. The set consists of shiny foil-board, Laser cut, ghost white acetate, a textured white leather type approach, a dark shiny foil board, and what appears to be taking the basketball player and swirling them around. To say the least, this product looks outstanding and because of that if I ran Panini, those basketball guys would be getting a huge raise. 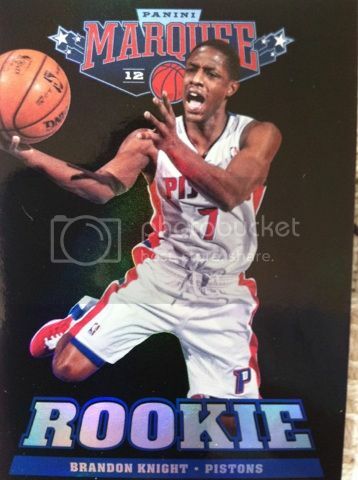 Another thing, if you are collecting a particular rookie this year in basketball. Here is a chance to get that guys rookie card 5 different ways as the double rookie class appears in each of the 5 sections. To me, I have waited almost 15 years for a company to finally put forth the extra mile for their base cards and make set building worthwhile again. Big Kudos to Panini! INSERTS: As you can see, the insert design matches the base card design. Something very tricky to do. I like the idea. The designs are different and once again very eye appealing. I am actually having a hard time writing this review since I am so blown away by the design here. AUTOGRAPHS:You get three autographs with this product, despite how great they look, the upsetting part here is the hit quality. I have seen this a few times in this product in terms of peoples hits. 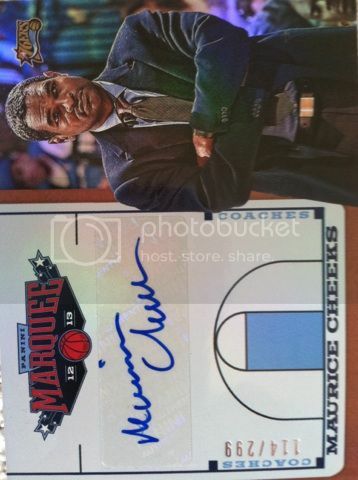 But the big hits are here with rookie signatures and Election Night autos where you find Hall Of Famers hiding. 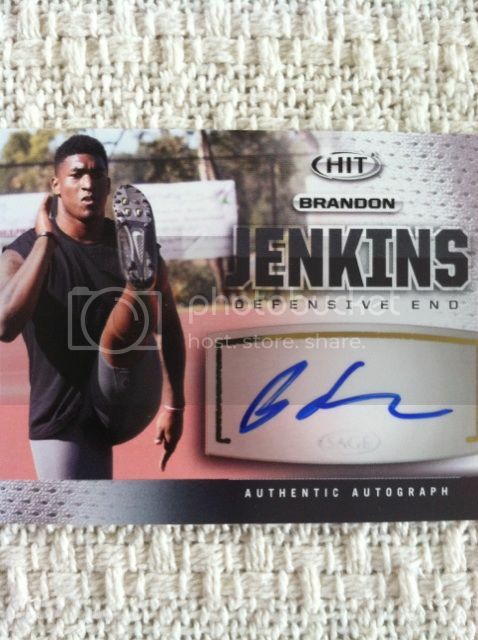 I do like the addition of coaches autos to this product however. It keeps this product fresh and unique. 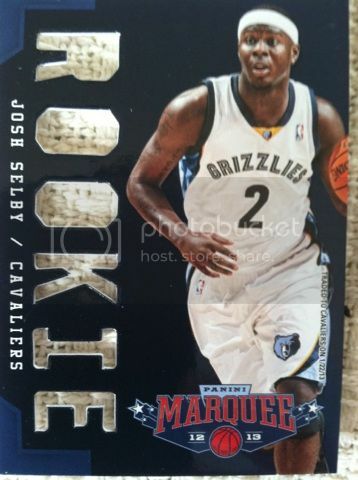 JERSEY/PATCH CARDS: N/A Thought I think this would be great to see in this product. OVERALL THOUGHTS: I have to be honest here, I think this product is worth it. You can't always judge a product from one break. The hits weren't there for us, but the product just looks so good and it doesn't mean the hits will not be there for you. 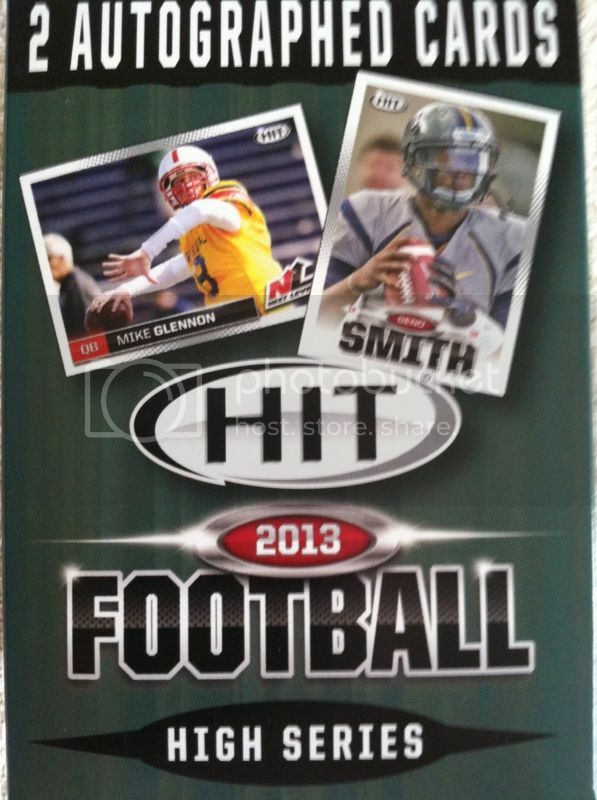 And the amount of rookies you get in this product should help make up the loss you get if you don't get the big hit. I had fun and looked forward to opening every pack to see which insert or subset card I was going to get. You don't do that very often with a product anymore. If you are a rookie and set collector especially..set forth to your LCS or order online to try this product. Promise you will not be disappointed! Base Design: 5 maybe even a 6! 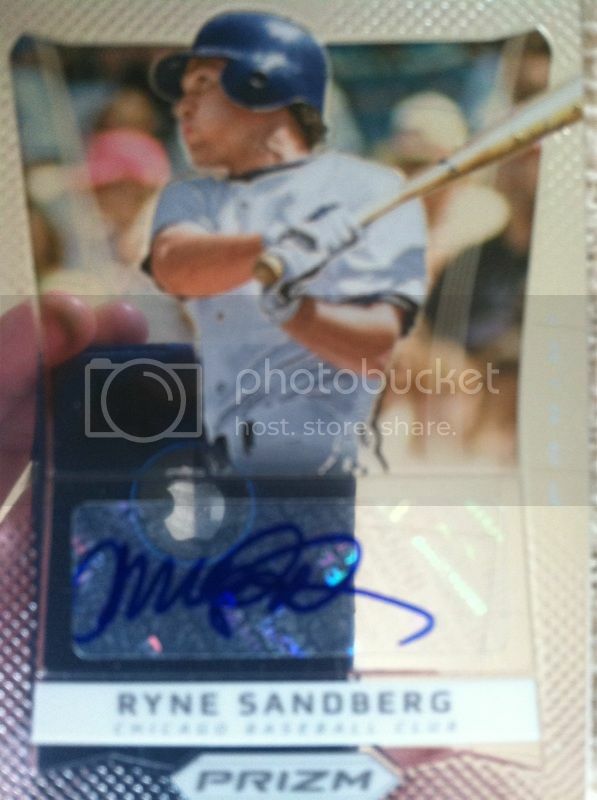 Now appearing right here on Sport Card Collectors..the one..the only..Panini Prizm Baseball! We reviewed the first two versions of basketball then football. What was our thoughts on the baseball release read below to find out! And then as always we are welcome to your thoughts on our break, the cards or from a break you might have done yourself. Also find 1 Elite Extra Edition, 1 Rookie Relevance, 1 Brilliance, 2 Team MVPs, 1 Top Prospects, 2 Dominance, and 2 Team USA per box! 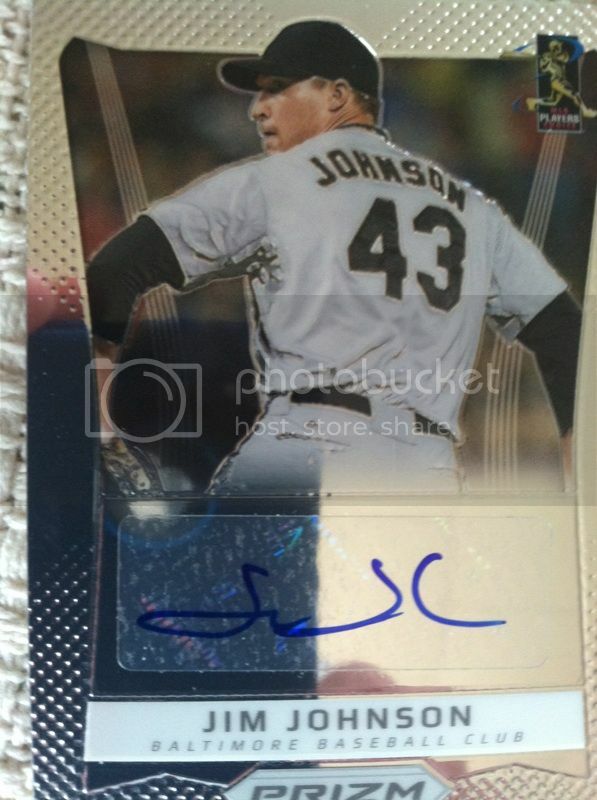 BASE CARDS: I quite enjoy anything that has the "chrome" technology so the base cards did not disappoint. I have got to say though I wished the border on these were a bit thinner as it takes up a lot of the card..but with this technology it doesn't kill it too much. Though a little less would be better. I do like the well rounded checklist with mix of rookies, vets and legends. We landed a good amount of rookies per box. But on a huge note....the base cards DO NOT BEND! INSERTS: You gotta love the "Prizms" in the product. You get three per box on average and could find some Gold versions as well. And the Prizms may be what this product is about. 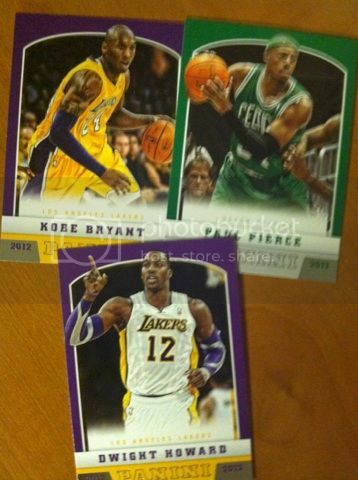 In our break I was surprised we got three rookie Prizms and not a vet one, which to me a rookie collector, is great. Another positive note is with them being so limited per box with three and Golds being so rare this should help keep the value up on them cause everyone is chasing them. I personally think it would be a challenge and fun to try and put a set together of. Also, another thing that I liked with the baseball version compared to the other two is the addition of some color to the inserts. 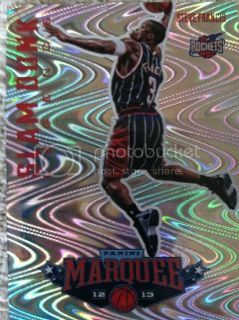 I think they could make a Elite Extra Edition Prizm. Those cards really stand out in the "chrome" technology. 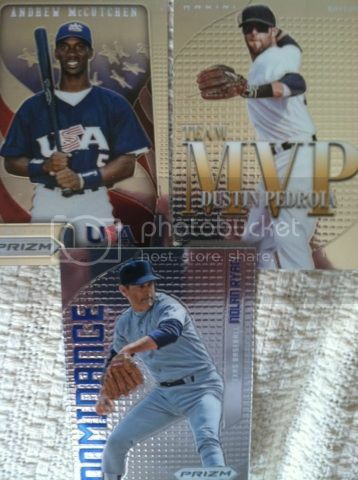 Another insert that I really enjoyed is the USA Baseball cards. 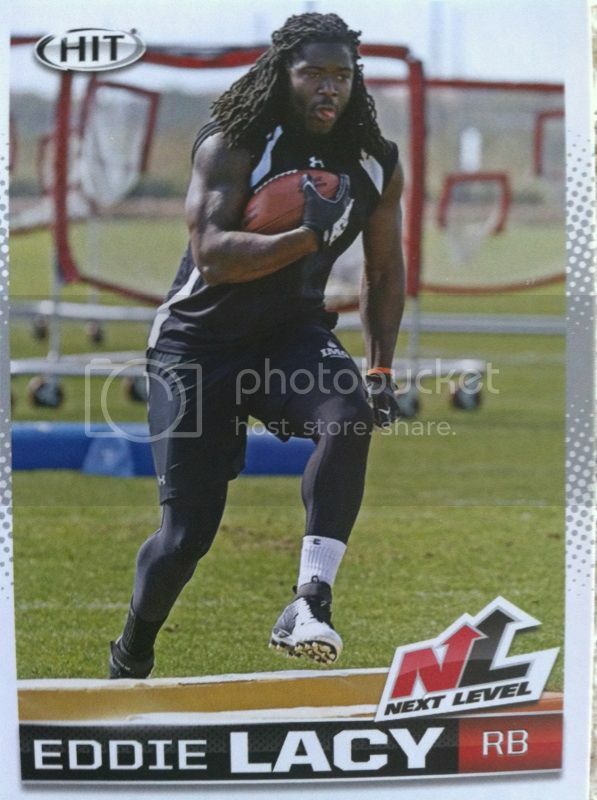 The flag in the background with the player in the forefront really jumps off the card to me. AUTOGRAPHS: Two autographs per box. Thats one more than its rival counterpart. But with a good checklist you just never know who you will end up with. It could be anyone whether its a vet, rookie or legend. We got lucky on this one and landed a vet in Jim Johnson and a legend in the one and only Ryne Sandberg. OVERALL THOUGHTS: If you haven't tried Panini Prizm baseball yet I think you should give it a go. 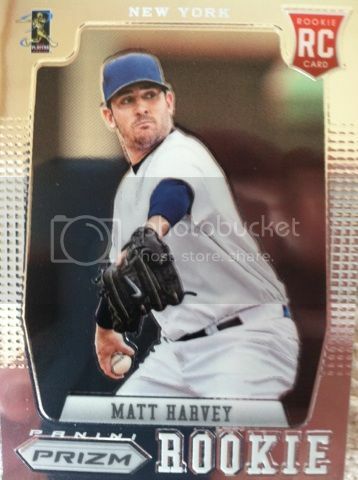 Good checklist of rookies including Bryce Harper and this years rave of Mets pithcer Matt Harvey. 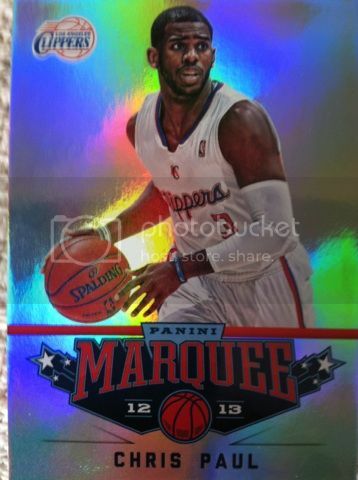 The Prizm parallels are also a hot and a valuable commodity. 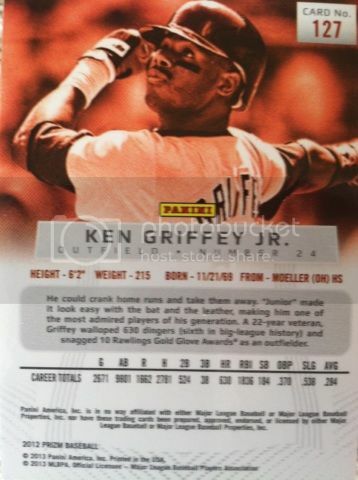 Imagine pulling a Bryce Harper Gold version..that would rock. 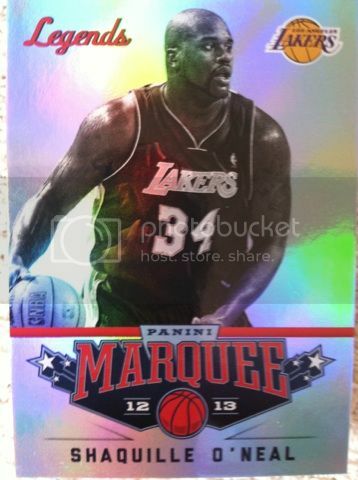 This one is more decently priced then the previous two Prizm sports that you couldn't find under a $100. So for $100 you get two autographs, three Prizms, some inserts and a good amount of rookie cards that we landed 2 per pack in our box. For some this may seem steep still, but I think it could really pay off in the end. Wanted to give this product another go...this time i got both autographs in my box. I still like the product as a fun break. With a double rookie class, which we got two rookies of each Irving and Lillard now from two breaks this makes for load up on rookie product. What are your thoughts on this break now that you have seen two of them? Once again, some great late 90's innovation and design. The Spx cards were just simply amazing with the combination of hologram and color. 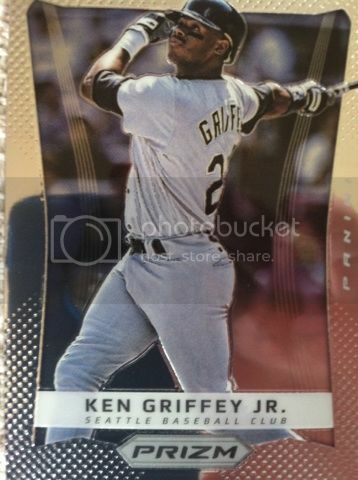 On another note, all of these Ken Griffey Jr. Cards Of The Week are strictly from my personal PC of him of when I used to collect him. Let us know your thoughts on this weeks cards and look forward to a new post next week! 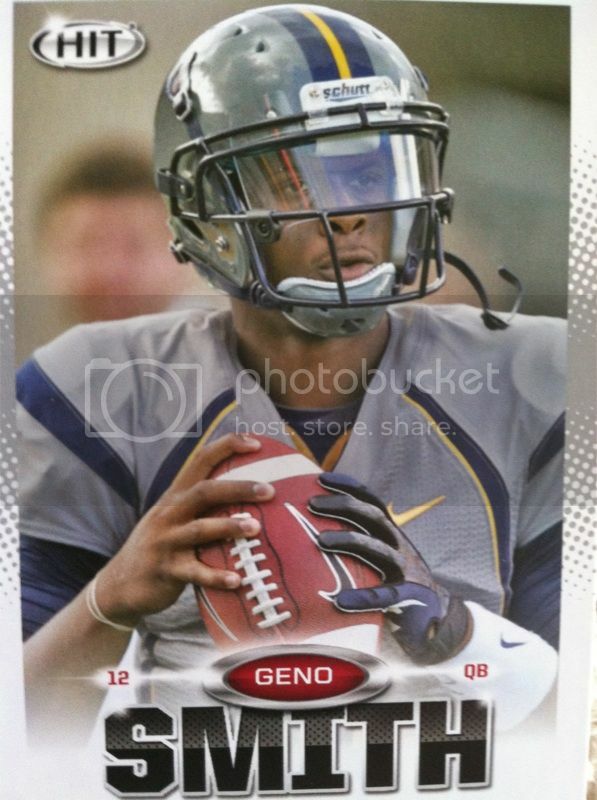 Really liked what we saw in the Low Series and with the High Series having Geno Smith among others in it..we had to try it. BASE CARDS: Last year I complained about the design of these. Not so much this year. Sage is doing the best they can without licensing on the helmets. I do wish they did more photos without any helmets then it wouldn't bother me as much. Its really hard to see a product with helmet decal removal but most of these photos are well done without team helmets which excites me and tells me to give Sage two thumbs up. The Spotlight subset card is very nicely done and I think a lot of people will enjoy this design. I also like to use these base cards to get rookie autos TTM (Through The Mail) on. They are low to none on the gloss and are great to be signed on. 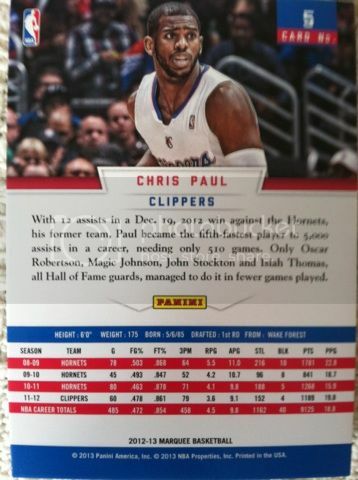 OVERALL THOUGHTS: Not a bad base card design. A ton of base in a box so you really get to load up on the new rookies. My only negative would be having the two autographs packed separately in the box. 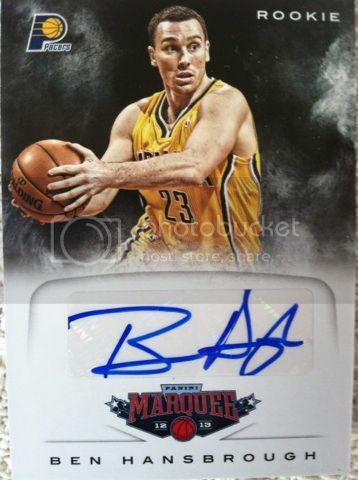 Though I love collecting rookie cards, opening the packs for just base cards takes away a little bit of the excitement when you already know what your autographs are. 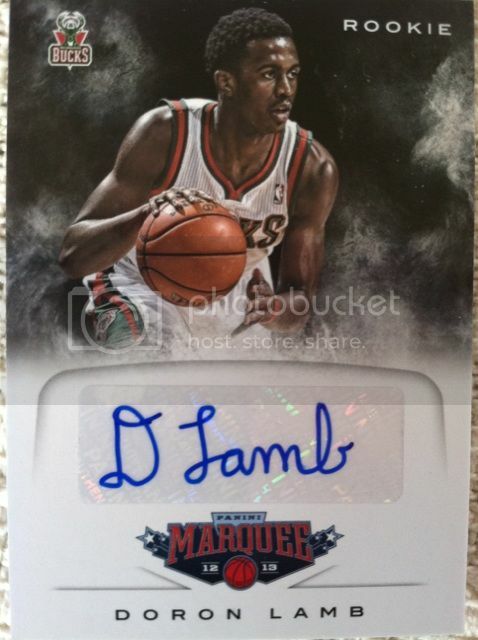 I wished the autos were inserted into the packs.With so many cards even if they are worth $1 each you have value. And even with no name autos as we appeared to hit in this break they are worth $6 each at least. That alone makes up value in the box. But I do wish they would add the parallels back to the retail product. I used to like pulling the silver foil board ones. With the autographs packed separately so you see them first, the rest are base cards, so I think mixing in the inserts and the 2 autographs into the packs will make it a much more fun product to bust. But there is definitely value here. Thought I would give this product a bust. Didn't have enough for a blaster..so busted a rack pack. I was somewhat impressed and not impressed at the same time. Pack: This pack came within a clear rack pack package. Not very eye appealing. Base Cards: Not bad looking. A wide open look. No border besides a bottom one. Photography not bad either. 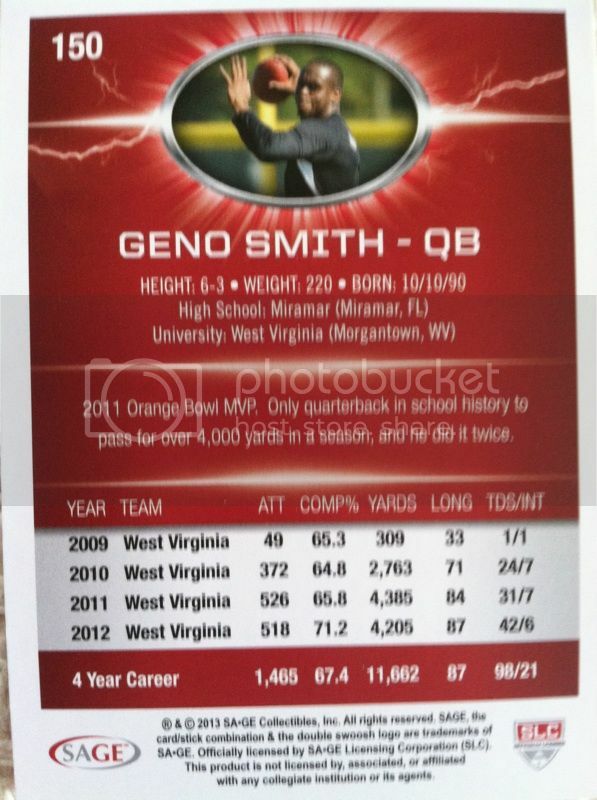 And who doesn't like reading the first stats from the 2011 season from their favorite Vet players. 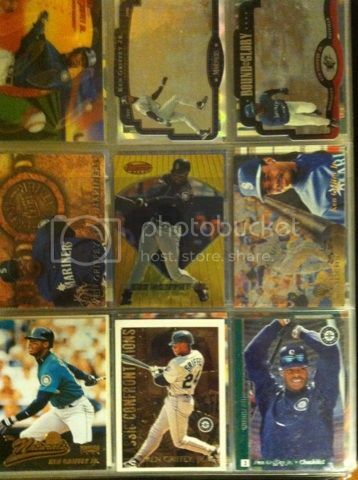 Inserts: Parallels, other inserts not too bad. The purple parallel up to the top are 3 per rack pack. They were individually wrapped. 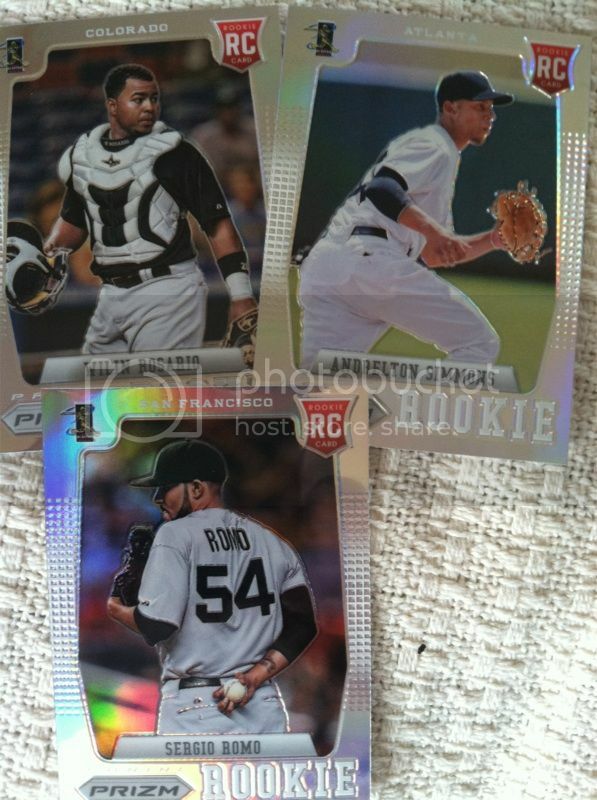 Inserts don't look bad, but I DO NOT like the look of the rookies in this product. 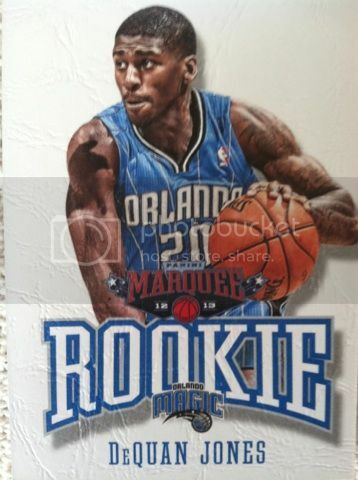 I know that the photos of the rookies were not yet ready when this product was released...but they look very cartoonish. I don't like the rookies in this product. The parallels are cool, but the rookies themselves are not. 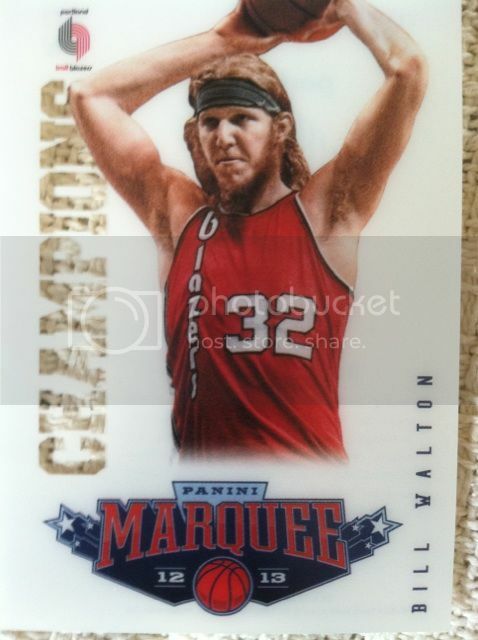 Memorabilia: It wasn't guaranteed but it was a nice surprise to find one in our rack pack. Our first memorabilia hit of 2012 for football. Jake Locker will be an upcoming star next season. The design isn't bad either. Overall: Not a bad first NFL licensed football release. I would much rather have Panini Prestige that comes out soon. 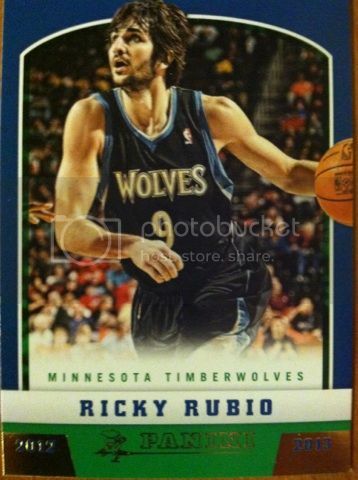 But the other than the really ugly rookie cards, this product is worth the buy. 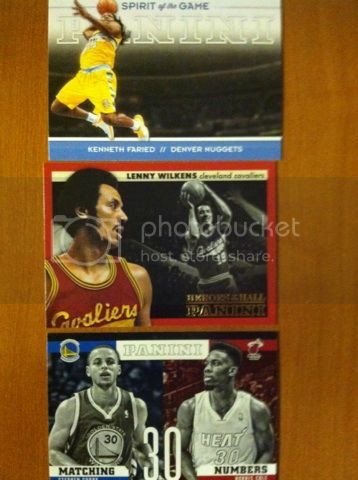 Upper Deck must have heard me praising Spx 1996 and Spx 1997 as they have now decided to include them in their upcoming 2013 Spx Product!! The product is set to release June 2013. There will be 5 cards per pack, 10 packs per box. 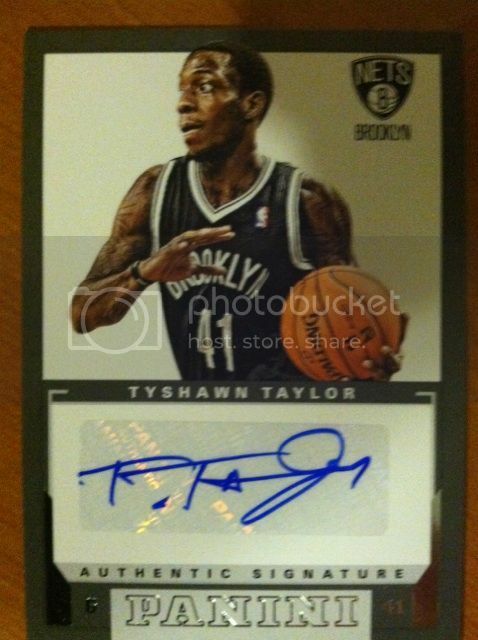 There will be Three Autographs per box and includes at least one SPx Rookie Auto Jersey with a jumbo swatch! There will also be one single, dual, triple or patch memorabilia card per box as well. 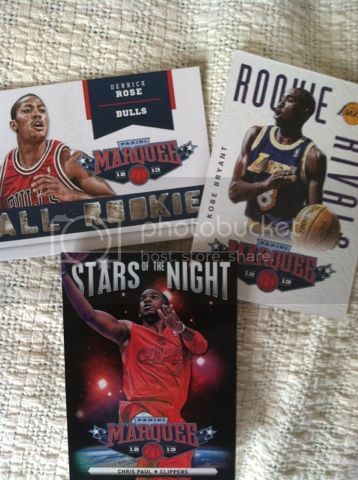 You can also find three SPx Finite Rookies or Legends per box! 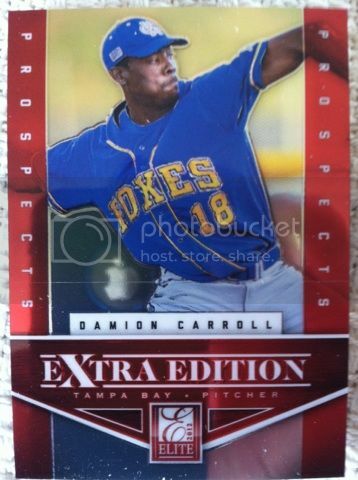 And here are the fore-mention of the 1996-1997 Spx cards. You will find 3 of these per box. Busted a box of this to earn myself some of the Father's Day packs. Here is how I did. Wasn't spectacular, but the cards looked nice. Box/Pack: Threw away the box and wrapper before taking pics. Not bad looking though. A draw with Adrian Peterson and Blaine Gabbert on the front. However my one complaint would be there is no amount of hits listed on it. 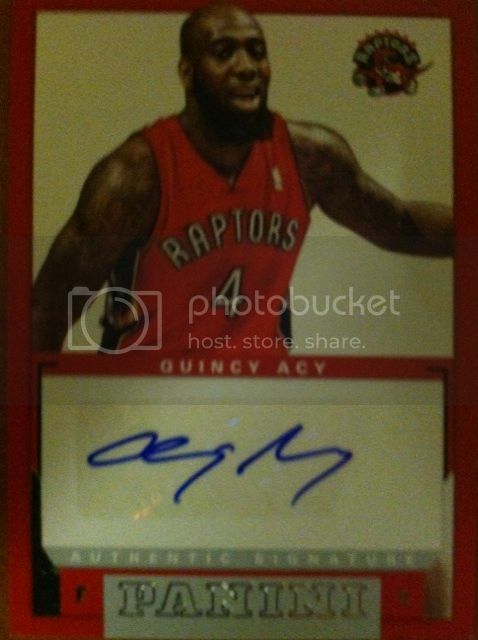 I found out it had 4 auto/memorabilia only because I searched it online before purchasing it. Base: Love the silver shine. Nice design as well! Usually not one for thick borders..but it does look good in this product! Inserts: We got a few parallels such as this red one. They are numbered as well. 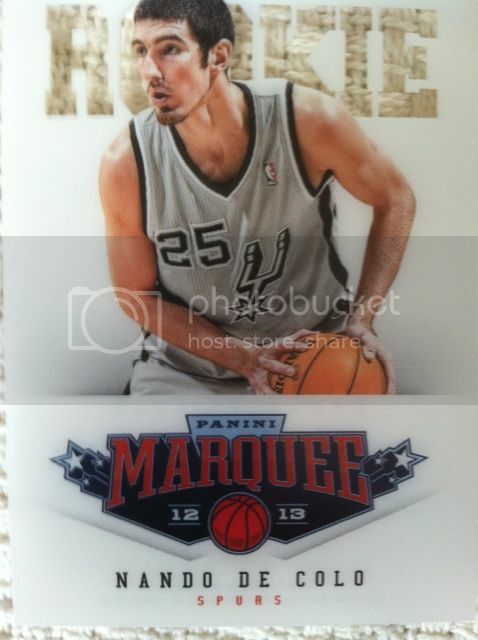 The card looks great in red as it does in the silver/black. 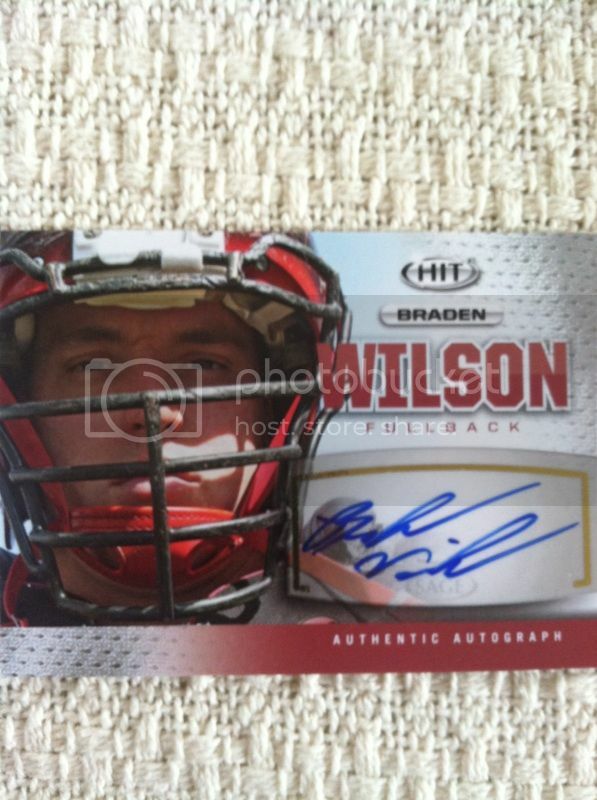 Memorabilia: Thank goodness we got an Andy Dalton, our first memorabilia hit of him and only hit of him of the 2011 season. But if it wasn't for him...this box would have been a poor break. Just like the base cards, the jersey cards have a shine to them as well! They look great here and even better in person. We also seem to have a nack for pulling Austin Pettis in 2011 products. Autographs: Love the Longevity shiny writing in the background. Very poor player pull. 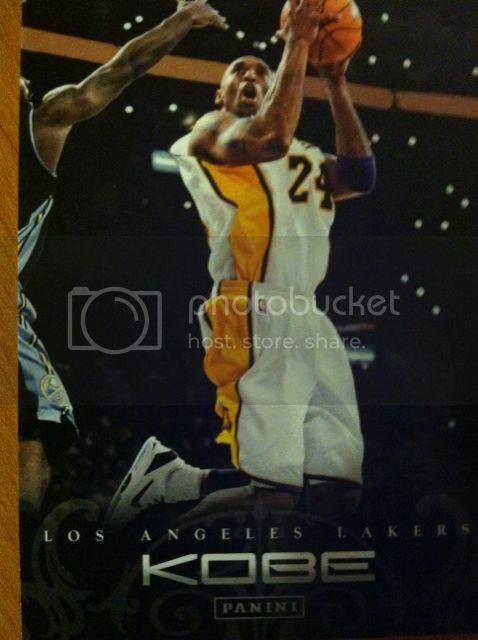 But a nice looking card. Overall: Nice looking product. Boxes can be found for $60 or lower. 4 hits. Great amount of hits for the price. Very much worth the risk. Graded Cards..why we don't bother. Mail Day...Nice Brett Lawrie and more! Even More Things For You Guys! Who's the KING of Box Breaks?